Before diving into this piece, let me just acknowledge up front, that this passage has absolutely nothing to do with using honorifics to address others. From my childhood to this day, the, above, passage has been taken out of context, and abused to support a doctrine that, while good, is unsupported in scripture, particularly, this one. That said, this was the passage used by the church of my youth, to prove that those who used honorifics to address their preacher, were sinning when doing so. Such an act was clearly a transgression of God’s law. And those who did it were in violation of a most sacred precept. Any church that encouraged, or even allowed such behavior was obviously a false church. Though I acknowledge that such a teaching does violence to this passage, I still believe that the core of the doctrine is valid. I can think of no such honorific that should be applied to men or women of the cloth, no matter how honorable they may be. Back when I was preaching on a semi-regular basis, I never allowed myself to be called, reverend. I never regarded my self as one to be revered. I have never trusted or respected those who did. Anyone who things they deserved to be revered, top the list of those who never should be regarded so. I am having a hard time wrapping my mind around the brand of narcissism required to believe one is actually worthy of such honor from other humans. I don’t even feel worthy of such honor when it comes from my dog. I am not a sheep, and have no need of a shepherd. To shepherd a flock is to feed and keep it from danger. Calling another person your shepherd is to suggest that you need someone to feed and watch over you. It also suggests that the person who regards himself your shepherd sees you as a smelly, stupid, weak-willed creature that needs constant tending, and that you need saving from the constant danger of wolves, and marching off cliffs. Thanks. Potentially least offensive of the four major titles is Rabbi. It just means, teacher, or teacher of Jewish law. Generically speaking, it’s fine. If I style myself as a student of Jewish law, it is only right that someone, or a group of people be considered my teacher. But the word is not used, generically. It is used with religious overtones. It sets up a pastoral relationship, and implies reverence. There is no since of curriculum and accomplishment. It is a relationship of permanent submission. By now, we should all know the difference between learning from a teacher, and submitting to a higher authority. The Rabbi relationship is on of power and authority, not an exchange of ideas among equals. I could write a book on this title, alone. But I’m sure someone has already done it. Therefore, I will leave it to a single observation: I have a father. A Catholic child must be the most confused person in the world. God wants to be his father; every priest wants to be his father; and his father wants to be his father. Of the three, his bio-dad is probably the least of his fathers. 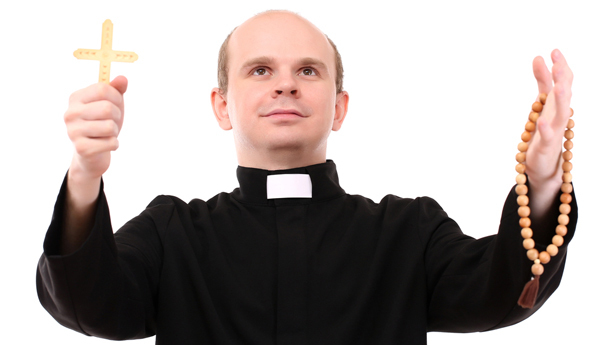 Unlike with bio-dad, one never grows up in relationship to his priest father and heavenly father. To those, he stays a child, always needing one to intercede on his behalf to the other. I have a father who’s knee of love and discipline, I have forever outgrown. I am not in the market for another. In the end, all these titles are the same. They represent our smallness compared to the god we choose to serve. No matter how much we babble about a personal relationship with the Almighty, we intuit that there is so much distance between us, we need someone higher than us, better than us, more connected than us to interface with the big guy on our behalf. They are less about the men and women on which we bestow such titles, and more about the recognition of our own inadequacy before a god too big for us to face. We dare not go into the Holy of Holies lest we be burned, so we appoint one to do it for us. For my part, I cannot serve a god that I cannot directly access. If I need to access him through one I revere, then he is too holy for me. If I need a shepherd, he’s too sheltering. If I need a lifetime Rabbi, his law is too complicated. And if I need a third father to reach him, Then he is a sick, creepy bast**d! This entry was tagged father, flattering titles, paster, priest, rabbi, reverend, shepherd. Bookmark the permalink.